"..."Merchild" is a risky and provocative piece of writing that made for a challenging assignment in Berwyn. Like a lot of dramas about family problems, it needs a rewrite with an eye on shading, nuance and the quieter conversations that inform how we solve things, and also how we sometimes make everything worse." "...Lathrop’s graceful play never gets bogged down in didacticism; it is matched well by Filmer’s strong casting and subtle direction. 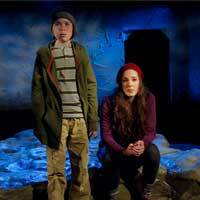 Malcolm Callan and Lia D. Mortensen are compelling as the baffled parents, but Peyton Shaffer, as the boy at the center of the story, steals the show with his remarkable performance." "...While I found the acting to be superb, and the lighting ( Cat Wilson) and sound (Barry Bennett who also did the music, which was very special) very fitting, I found the set (Joanna Iwanicka) a bit much, but realize that the small stage made this almost impossible to pull off. They did build walls but because they were open at the bottom, I found that the walking behind those walls became confusing to the action. The action is one hour and forty five minutes, two acts with a 15 minute intermission. This play might have been better off as 100 minutes straight through with no break in the action. It could work better without a break."